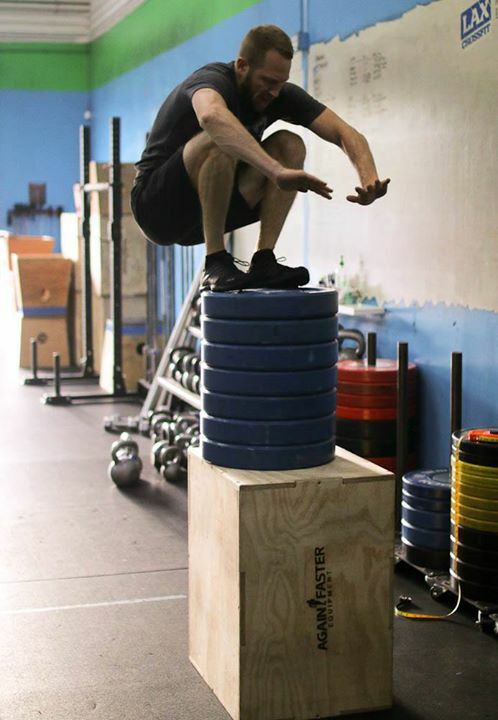 Today’s class will give every athlete an opportunity to find their max height box jump. In doing so, many of you are going to experience a bit of fear: fear of falling down, fear of heights, or maybe just fear of doing something that your body has never had to do before (But no longer a fear of scraping your shins, since we have foam plyo-boxes now!!). Hopefully, by the end of class, many of you will leave not with fear – but with a sense of accomplishment and greater confidence in what your body and mind can do when you push them both to new limits and challenges. After a solid warm-up today, we’ll go over some safety considerations as well as some technique tips to ensure you can successfully land the highest jump possible. Here’s some video footage capturing a CrossFit athlete Kevin Bania breaking the world record for max height box jump (64.5 inches). Notice the athlete’s body position as he sets up, initiates his jump, moves through the air, and finally sticks his landing. What connections do you see with other movements we do on a normal basis for our warm-ups and WOD’s?? ?